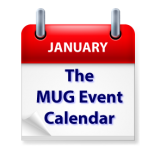 The MUG Event Calendar has lots of interesting topics on tap this week. A California group will look at using iMazing to maintain their iOS apps, a Florida group will discuss Apple’s Mail app, and a Michigan group will evaluate Facetime. YouTube will be the featured topic at an Arizona group, and a Virginia group will examine photo curation.